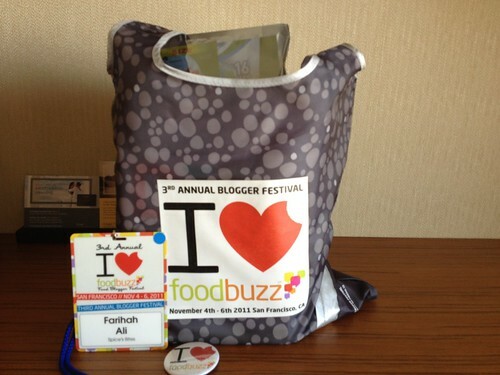 And here we are at Day 2 of the 2011 FoodBuzz Blogger Festival! Just like last year, Day 2 was my last day due to the time of my flight on Sunday. I swear, one of these times I’ll make sure I have enough vacation time left to spend a couple extra days in San Francisco! I knew my body clock would be a little messed up due to the 3 hour time difference between CA and GA, but I was not expecting to be up at 5 am! I tossed and turned for a while and finally just gave up and got up. Apparently breakfast in the hotel restaurant was included with my room, so I decided to kill time by eating. That’s not such a bad way to kill time, is it? It was 6:30 am so I didn’t feel the need to dress to impress, but I was surprised to see how many people were up and all ready for the day. I decided to opt for the breakfast buffet so I could try a little of everything. 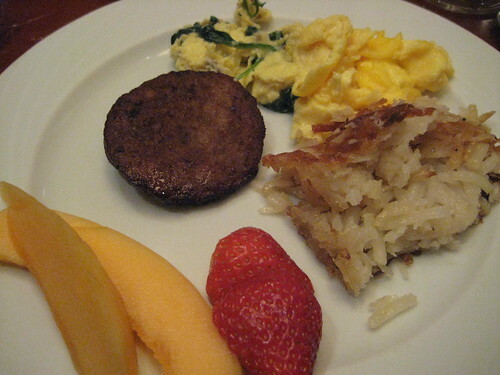 Okay, fine I got seconds on the hashbrowns, fruit and sausage. And I had a croissant as well. I was hungry!! I spent the rest of the morning attending various sessions at the FoodBuzz/Federated Media headquarters. I took lots of notes like a good little food blogger, but I think the jet lag was messing with me, since I just didn’t feel like moving around much. Luckily my sessions were in the same room so I just stayed in my chair. There was a nice little breakfast spread, but since I’d already eaten I wasn’t hungry. 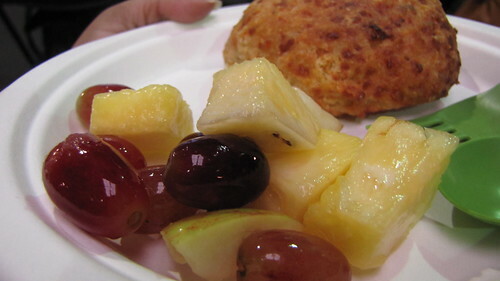 I ended up picking up a black-pepper cheddar scone and some fruit for a snack later in the morning. 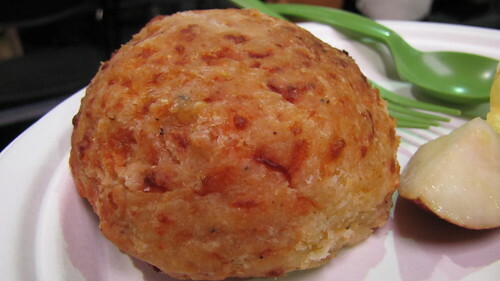 I loved this scone! I’m not a huge sweets person in the morning, so I really liked that there was a savory option. After the morning sessions were over, we got on shuttles to take us to the Metreon for the Tasting Pavilion. I learned my lesson from last year and decided to walk around first before deciding on which displays to visit. I didn’t take as many pictures this time, mostly because I was still having camera issues — mostly due to user error, but also due to lighting. Courtney of The Granola Chronicles, Diana of The Chic Life, and me. 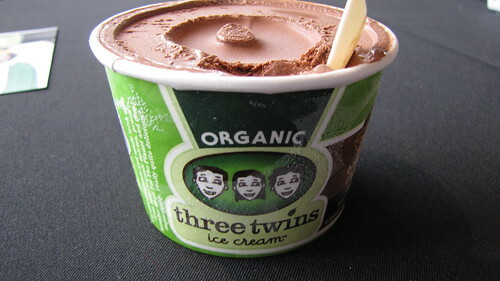 I was happy to see Three Twins at the Tasting Pavilion again, their ice cream is so good! 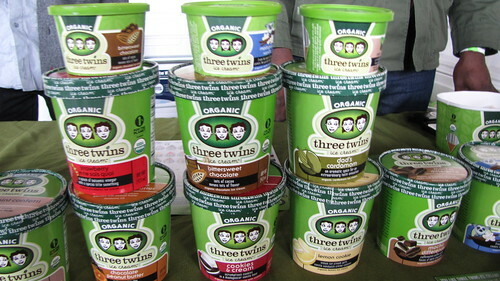 I really want to try their Dad’s Cardamom and Lemon Cookie flavors. Hint hint for next year? 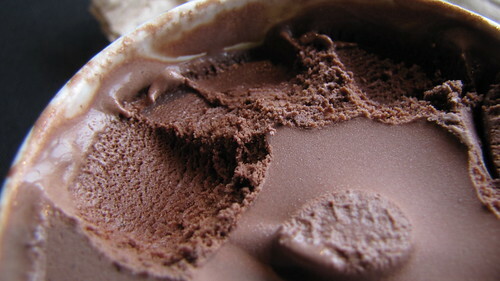 But I won’t say no to some good old chocolate ice cream. 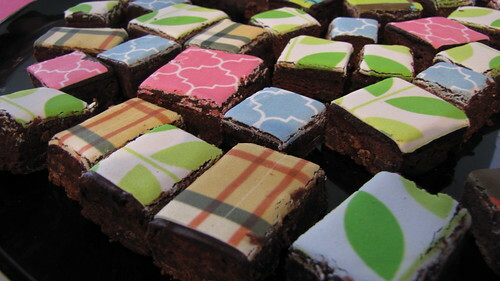 Especially when the chocolate is rich and decadent. 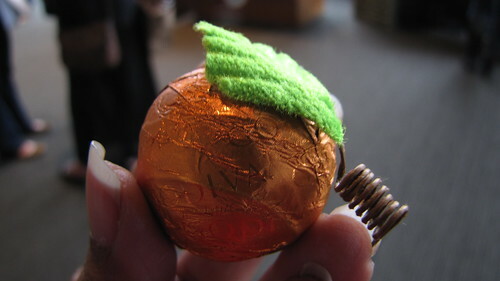 The cutest little pumpkin truffle, the inspiration for Godiva Coffee’s Pumpkin Spice coffee. 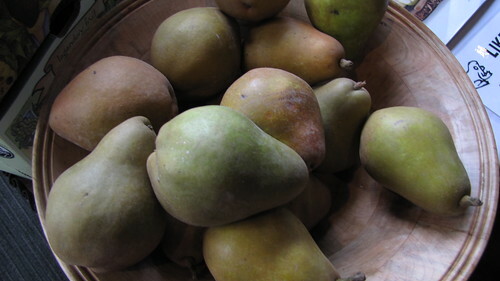 Frog Hollow Farm pears — so so good. Two of these babies came home with me. 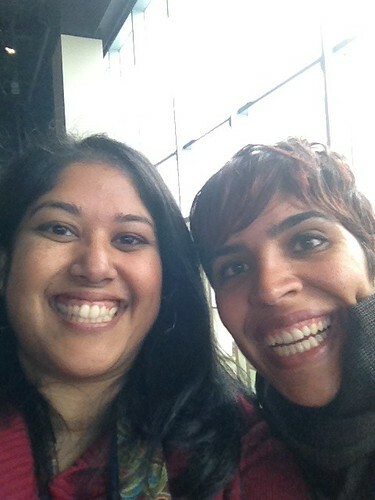 Me and Sonia of Velvet Aroma, who I met at BlogHer Food 2011. We were allowed to bring a guest to the Tasting Pavilion, so I asked if she wanted to meet me there. 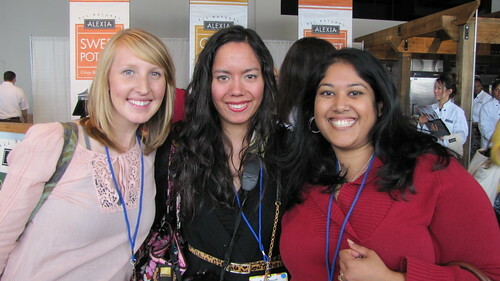 It was great to catch up, hopefully we’ll meet up at BlogHer Food 2012! 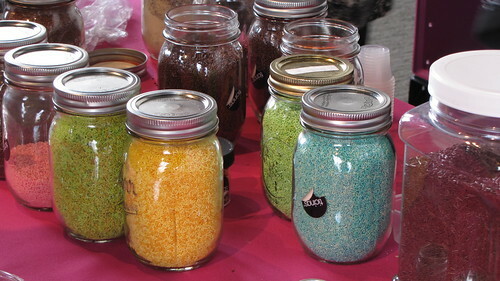 I’d stopped by the Alexia booth earlier to say hi and introduce myself in person to the folks there. Then I stopped by again later because there was a growing crowd and I was curious about what was going on. 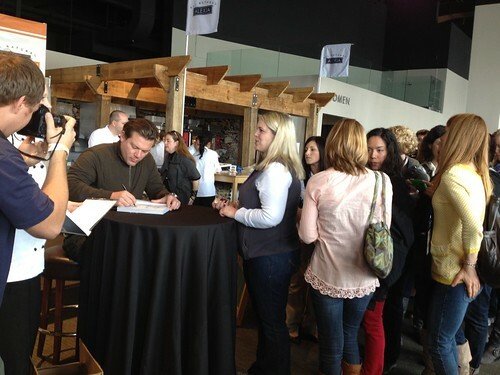 “Tyler Florence is stopping by to sign books! They just tweeted it!” People were jostling to be first in line to meet him and I was trying to sneak away since the “Reinvent a Classic” finalists had a meet-and-greet scheduled for later that afternoon. But I was spotted and got to cut to the head of the line to meet him. Sorry, guys! Stupid me, instead of wearing comfy shoes I decided to wear boots, so my feet were killing me. I ended up leaving the Pavilion a little early so Sree and I could hobble walk back. At least we had a chance to burn off some of the damage from earlier! Next up, my meet-and-greet with Tyler Florence! man – that festival was a good time! 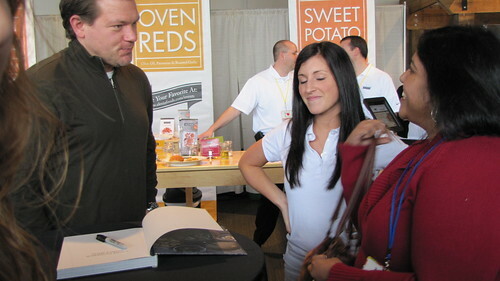 so jealous you got the meet Tyler Florence! Congrats!